Today marks 40 years since Italy legalized abortion. But the promises of the law remain unfulfilled. Today, Ireland will vote on repealing the Eighth Amendment to its constitution. The Repeal the Eighth campaign opposes the amendment because it grants an unborn fetus a right to life equal to that of the mother. A “Yes” vote on Friday would open the way to an extension of legal abortion, meaning Irish women would no longer be forced to travel abroad for the procedure. While in much of the world we see moves to limit women’s reproductive rights, in Ireland pro-choice campaigners are on the advance. The referendum falls on the anniversary of Italy’s 194 Law, which passed in 1978 and legalized the voluntary termination of pregnancy (VTP). 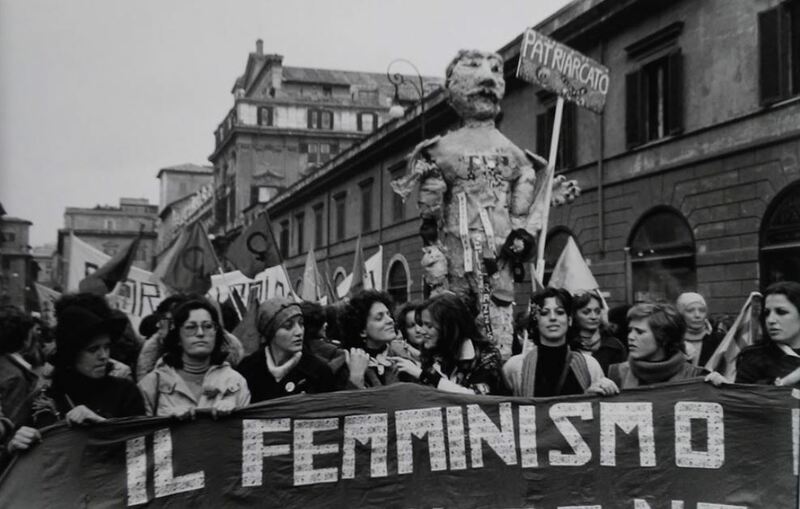 Yet four decades later, Italian women’s right to self-determination remains on shaky ground. The 194 Law is undermined by the presence of a vocal anti-choice movement, the neoliberal restructuring of the health system, and the uncontrolled spread of a physicians’ “conscientious objection” movement. Since November 2016 Italy’s Non una di meno movement — part of the global Ni una menos movement — has taken to the streets to defend and extend women’s bodily autonomy. Our forty-year experience with the 194 Law has much to say to reproductive justice movements around the world. Italian women’s battles over the last four decades show that any abortion law has to be founded on women’s freedom of choice — or it won’t work. Italy’s 194 Law arrived at a time when the personal had become political. Italy was one of the last European countries to legislate abortion rights, building on the 1973 Roe v Wade decision in the United States and on rising feminist movements at home and abroad. Those movements struggled simultaneously in homes, in the streets, and in Parliament. Italy was a highly conservative country with regard to sexual and reproductive issues. Pier Paolo Pasolini’s 1965 documentary Comizi d’amore (“Love Meetings”) provides a glimpse of Italy in that era: highly traditional and deeply influenced by the Catholic Church, yet on the precipice of change. The seventies saw Italy’s transformation from a rural/proto-industrial society to a fully industrial one. Women’s roles were progressively restricted: from 1959 to 1972, the number of women workers fell by 25 percent. At the same time, a feminist vanguard was emerging and Fascist-era family laws were drastically transformed by a 1975 legal reform which ended the legal supremacy of husband over wife. Until 1978, under still-standing Fascist legislation, abortion was labelled a “crime against the integrity and the health of the bloodline” and punished with imprisonment. Because of this law, and the social condemnation that flowed from it, the wall of silence around abortion was unimaginably difficult to break through. On the eve of the 1978 legislation, the United Nations estimated that one million illegal abortions were performed in Italy every year (though the real figure was probably lower, given that after the first year of legalization, the number of legal abortions was slightly less than 188,000). Before the law’s passage, between eleven thousand and twenty thousand women died yearly after getting an abortion. In the mid-1970s, terminating a pregnancy in a private clinic would cost up to one million lire (around $6,250 in today’s US dollars), while “cut-wives” (known by the derogative term mammane) would ask for $200 to $1,000. Working-class women couldn’t afford private clinics and often died at the hands of mammanes or as a result of a self-induced termination. In the late 1960s feminist movements started to make abortion a political issue. In 1972, the International Feminist Collective published a dossier called “State Abortion: Massacre of the Innocents” (using the feminine form of “the innocents”). The rhetoric portraying abortion as the killing of fetuses was reversed: the focus was finally turned toward the thousands of women dying because abortion was illegal. Slowly, women started talking about their reproductive experiences. In 1975, the weekly magazine l’Espresso was charged with “contempt of religion” for publishing a cover featuring a crucified pregnant woman. Some Italian feminists, like the Milanese group Rivolta femminile and the philosopher Carla Lonzi, deserted the abortion rights struggle. They considered the law inherently violent and wanted to focus on non-reproductive sexuality. Meanwhile, the reproductive rights campaign moved beyond the constitutional question to build a liberation front against patriarchal culture itself. The main institutional actors in this struggle were the Movement for the Liberation of Woman, linked to the Radical Party, and the Union of Italian women (UDI), linked to the Italian Communist Party (PCI). Until that point, in the PCI’s view, “women were not understood as women per se but as workers who happened to be female.” While the feminist movement had been active for some time, it was the debate on abortion that caused an earthquake in the Italian party system and pushed women’s movements into the corridors of power. The 1978 law did not come out of nowhere. Already in 1971 and 1973 two bills had been presented by the Socialists; in 1973 a woman persecuted for having an abortion, Gigliola Pierobon, was finally “granted a pardon”; and in 1975 a Supreme Court decision prioritized the psycho-physical health of the woman above that of the fetus, which “has yet to become a person.” The following year saw the Seveso chemical disaster, after which pregnant women were granted an exceptional right to terminate their pregnancies. The parliamentary debate started in 1976, just after the formation of a new Christian Democratic (DC) government backed by the Communists, and continued even during the Red Brigades’ kidnapping of DC party leader Aldo Moro. The 194 Law was the first important law to pass after Moro’s body was found on May 9, 1978. The final version of the 194 Law is entitled “Rules for the social protection of motherhood and voluntary interruption of pregnancy.” This choice of words reflected its Christian Democratic authors’ intention to place abortion in the same category as pregnancy. As a result of the law, women who choose to interrupt their pregnancy are forced into maternity wards together with new mothers. According to the 194 Law, women can resort to voluntary termination within the first ninety days only when “the continuation of pregnancy, childbirth, or maternity would result in a serious danger to their physical or mental health.” In other words, the Italian law does not guarantee women the right to self-determination. A woman isn’t permitted to receive an abortion simply because she doesn’t want to be pregnant. For these reasons, the Radicals and the far-left Proletarian Democracy party (DP), which played major roles in the reproductive rights campaign, voted against the law. It was necessary to reject the will to limit the right to voluntary termination to certain specific “cases” . . . These were clearly only formal measures, and they actually did give the woman the right to choose. And yet for this reason, they made their ideological meaning even more evident: they were introduced in order to reaffirm that women’s duty is procreation, so that those who refuse it must be marked as deviant. Two referendums were held on the 194 Law in 1981. The first, proposed by the Radicals, sought to enforce and improve the law; the second, by Catholics, sought to abolish it. Neither passed. The New York Times commented: “On abortion, Italian voters are less Catholic than the Vatican,” which apparently was not as self-evident as it may seem today. In the second referendum, Italians voted — with a huge contribution from working-class and peasant women — by an over two to one margin to keep abortion legal. While it was feminist movements that first introduced the debate on reproductive rights in Italy, silenced subaltern women were the ones who came out en masse to defy the authority of the Church and save the law. A key flaw in Law 194 is that it allows for conscientious objection by medical professionals. In 60 percent of hospitals nationwide, all medical staff are objectors, and only 30 percent of gynecologists provide voluntary terminations. Unless the woman’s life is in danger, gynecologists, anesthetists, and nurses can refuse to provide an abortion on grounds of ethics or religious belief. According to a gynecologist I spoke to, there were three types of objectors in the late 1970s: those who objected in the public health care system but practiced abortions in their private clinics (and still do); real Catholics; and those who decided to stop practicing abortion because it had become the only medical activity they performed and was too hard to endure. Today, objection is an easy career choice for gynecologists: abortion is a simple surgical operation and offers few rewards in terms of professional success. Moreover, when the chief of an obstetrical department is an objector, objection becomes a path to promotion. LAIGA, an association of gynecologists opposed to conscientious objection, reports that non-objectors in the Italian health system are frequently mobbed, discriminated against, and isolated. Since legal abortion is a constitutional right in Italy, hospitals have to provide it to their patients by law. If all medical staff working in a specific hospital are objectors, the ward director is required to provide patients with a doctor from another facility — but this rarely happens. Women are often forced to leave their province, region, or Italy entirely to get their termination. Ever since the law’s passage in 1978, Italian women have faced relentless attacks on their social and reproductive rights. Rome’s city council recently voted to shut down and clear out the International House of Women, one of Italian feminism’s most iconic sites. On the fortieth anniversary of the 194 Law the Ministry of Health released an official document on its application: the number of legal abortions has fallen steadily since 1983 (234,801), reaching its lowest in 2015 (84,925). Forty years on, some 70 percent of gynecologists in Italy don’t perform abortion. This number is on the rise, and in some regions where the figure stands at close to 90 percent, terminating a pregnancy can be as difficult as if it were illegal. Today, across the whole of Italy, only 1,408 gynecologists will perform the entire procedure. For this reason, illegal abortions are rising, especially among migrant women who are shut out of public health services. It is estimated at least twenty thousand illegal abortions are performed in Italy every year. In 2009, Italy was one of the last European countries to introduce the RU-486 (Mifepristone) abortion pill, under highly restrictive usage rules. Pharmaceutical abortion is permitted only within the first seven weeks of pregnancy (as opposed to nine elsewhere in Europe) and requires three days of hospitalization, while surgical abortion is an outpatient procedure. As a result, though pharmaceutical abortion is less invasive than the surgical kind, it accounts for only 16 percent of VTPs. Even the Social Rights Committee of the EU Council condemned Italy for women’s rights violations due to the restrictive effect conscientious objection has had on abortion access. The situation is getting worse, but also gaining worldwide attention by feminist movements calling it gender-based violence. The Obiezione respinta (“Objection rejected”) collective is mapping hospitals and pharmacies nationwide to illustrate the institutional denial of reproductive rights. For the fortieth anniversary of the 194 Law, Non una di meno (NUDM) has called for two days of street mobilization. NUDM seeks to highlight violence during childbirth, high taxes on women’s products, discrimination against migrant women in health care, and the full application of the 194 Law. It’s also reaching out to transnational struggles for reproductive rights, from Argentina (where Parliament is being forced to discuss a law legalizing abortion) to the United States, to Poland (where thousands of women went on strike to defend abortion) to Ireland, where the referendum to #RepealtheEighth is taking place today, May 25. Italy and Ireland have a lot in common; both traditionally Catholic and migrant, and hollowed out by recession. They may soon have a similar abortion law. The likely legislation for the Irish abortion law, should the Eighth Amendment be repealed, resembles the Italian 194 Law, including the possibility of conscious objection. A limited VTP law, of course, is an enormous advance over the absence of it. But Irish feminists should be aware that “conscientious objection” could restrict women’s rights to the point of effectively denying them. The lesson from Italy is clear: the only way to have reproductive rights is to keep the objectors out of public hospitals. But this struggle is not just about individual women’s rights. For “any abortion law regulates freedom, establishes and protects the conditions of reproduction of society as a whole.” In Italy and elsewhere, as fascist and sexist anti-choice movements grow their presence in Parliaments and public hospitals, the fight for reproductive rights becomes larger than itself. It becomes a global fight for liberation; for another society based on autonomy and self-determination. Michela Pusterla is a feminist involved in the Non una di meno movement. She is currently doing her PhD on Italian literature and coloniality at the University of Trieste.